Speaking on average, the bedroom is the place we spend most of our time on a daily basis. Complete rest and relaxation, deep sleep and pleasant dreams happen here behind closed doors, however, even here the lighting plays an important role where a true wellbeing atmosphere is concerned. Lighting and lamps fulfil, first and foremost, a functional character in many areas of the bedroom, although furniture pieces and design elements also show their full value when under the right light. Room light which caters for basic brightness, is also needed in the bedroom, room light is also needed, which provides a good basic brightness for the bedroom. This is achieved with use of a combination of ceiling lights and bedside lamps as well a standard lamp. 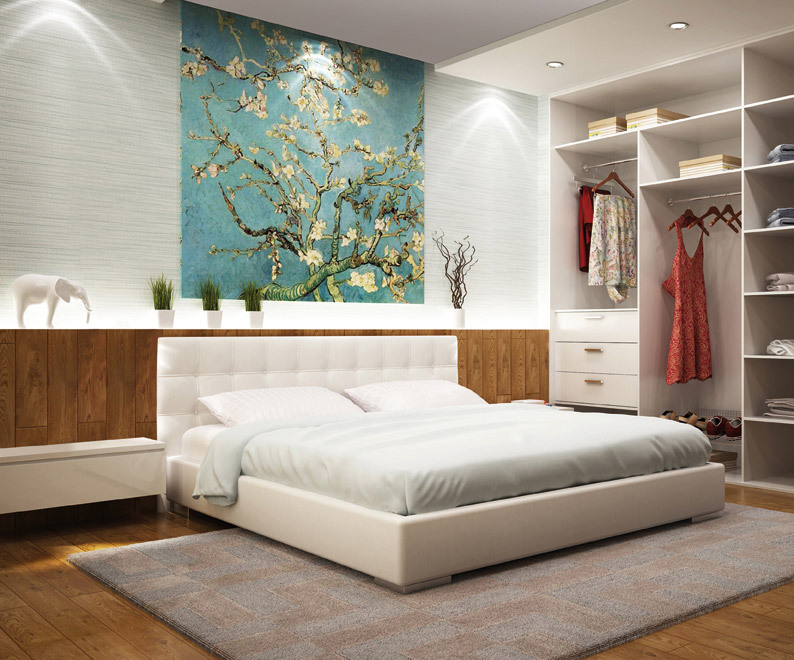 Even the bedroom wardrobe requires light which can be in the form of LED strip lighting, which illuminate when the wardrobe door is opened slightly to provide clarity. Glaring lights in every form should be avoided in order to protect tired eyes early in the morning. That’s why the lights and bulbs should be dimmable or indirect in order to create a comfortable lighting atmosphere at the beginning of the day without being obtrusive. Particular decorative pieces, such as furniture or pictures can be accentuated using picture spot lights, standard lamps, up- or down-lights, or mirror lighting. When choosing the right lighting and lamps in order to create the perfect lighting in the bedroom, the practical purpose must be observed, which is to produce brightness where needed. Adjustable bedside table lamps can, when needed, be switched on and they can provide enough light to light up the pages of a book without being obtrusive or disturbing. Night lights or a decent strip light, which can be attached beneath the side of the bed, offer orientation in the dark. Together with all these practical uses of Lamps and lights in the bedroom, we must not forget the wellness and relaxation factors. Warm white lighting is therefore the right choice for all installed lighting. Generally, creativity has no boundaries, so for example spotlights or lighting strips placed in different areas improves greatly the ambience in the bedroom. The right light in the bedroom manages to meet the functional purpose of fully illuminating the room, while setting accents that ensure pleasant hours of relaxation and peace and serenity.